Gardening and farm work often involves working with peat, vermiculite, perlite and mulch. These organic substances can produce dust when handled. Molds often grow naturally in these substances. Protection from dust is important because mold spores attach themselves to airborne dust particles. Anyone can be exposed to organic dust and mold. Greenhouse and nursery workers often get heavy exposure due to the enclosed environment and moist conditions. Repeated inhalation of mold and dust from peat, vermiculite, perlite, mulch or other substances can cause different illnesses. Exposure to organic dust and mold can cause bronchitis and asthma. Exposure can also aggravate existing bronchitis and asthma. If existing conditions such as asthma are known, it is important to use a respirator around dust and mold. Farmer’s lung is a noninfectious allergic disease. The symptoms are similar to ODTS, but farmer’s lung is specific to just one person. This condition causes an allergic reaction within the individual after exposure to dust and mold. With farmer’s lung, the immune system cannot adjust to the mold spores. Respiratory symptoms vary with the amount and intensity of exposure. After a first allergic reaction to dust and mold, it is likely that one will develop an increased sensitivity. Future exposure can cause even more severe allergic reactions. Contact a doctor if concerns about permanent lung damage arise. • Choose a particulate respirator with a minimum N-95 rating. 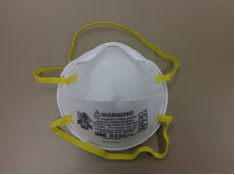 • Conduct fit testing to make sure the respirator functions properly and fits well. • Store the particulate respirator in a sealed plastic bag or a clean location and dispose of it when it is dirty. • Do not share respirators. For more details on respiratory protection, see Respiratory Protection, AEX-790.7. • Identify dust and mold in the worksite. Heavy concentrations of mold spores appear as dry white or gray powder or clouds. • Limit exposure to all dust and mold. ◦ Keep the worksite clean. ◦ Moisten material before disturbing/handling. ◦ Windy times of the day. ◦ Use of the dew point to settle the dust. • Avoid exposure to dust from decayed plants, leaves, mulch and other materials. • Use mechanical controls, such as fans and filters, to remove dust and mold from enclosed environments. • Jepsen, S. D., Micheal Wonacott, Peter Ling, and Thomas Bean. Agricultural Tailgate Safety Training: Dust and Mold, AEX 192.1.11. Columbus, OH: Ohio State University Extension, 2006.